Nachos are the ultimate delight food. The combination of crunchy chips, gooey cheese, and whatever fixings you’ve added is irresistible. People enjoy them at sports events, at parties, at parks, on trips, at the movies, at home … there is virtually no place that’s wrong for nachos. You can dress them up and dress them down, health-ify them and un-health-ify them, but the enjoyment is always the same. At Qdoba, we are the ultimate fans of this universally friendly food and want to shake the hand of whoever created it. That got us to thinking: where did nachos come from? While some of us are content to believe they’re straight from heaven, others wanted another explanation, so we did some digging. Here is what we found out about the origins of the ultimate comfort food! Nachos originated in northern Mexico, specifically in a city called Piedras Negras in Coahuila. It’s just over the border from Texas, which is great because that means it took almost no time to come to America. It was 1943, and some wives of U.S. soldiers stationed at Fort Duncan had just finished a shopping trip to Piedras Negras. Burdened by their purchases and hungry from finding all the best deals, they found that the town’s restaurant had already closed. However, the gracious manager, Ignacio “Nacho” Anaya, was kind enough to whip something up for the famished ladies. Word of Nacho’s especiales spread quickly, and quickly became shortened to “special nachos.” While Anaya went on to work at the Moderno Restaurant in Piedras Negras, he was able to open his own restaurant later and called it “Nacho’s Restaurant.” The Moderno still uses his original recipe, and it was printed in the 1954 St. Anne’s Cookbook. Anaya died in 1975, and a bronze plaque was put up in Piedras Negras in his honor. He died on October 21, which was declared International Day of Nacho, and his son served as a judge at the annual nacho competition until he died in 2010. How Did Nachos Arrive in America? The popularity of nachos spread like crazy through both Texas and the Southwest. 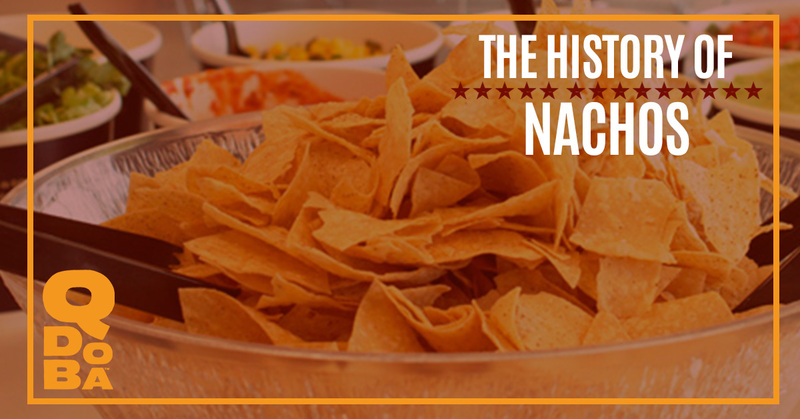 As far as historians can tell, the first appearance of “nachos” in English occurred in a 1950’s cookbook called A Taste of Texas. Legend says that a waitress named Carmen Rocha made nachos in San Antonio, Texas before she took the dish to Los Angeles, where it found a home at El Cholo restaurant in 1959. In 1976, a version of nachos was marketed by Frank Liberto at sporting events in Arlington, Texas. He used cheese sauce and pre-made tortilla chips, and this version was dubbed “ballpark nachos.” These nachos got national airtime when a sportscaster mentioned enjoying them during Monday Night Football games. Nachos became more and more popular, and now you can find them practically everywhere. Nachos aren’t just widespread; people have found all kinds of different ways to play with them and create whole new nacho experiences. At Qdoba, we work hard to create great nachos, but we understand that nachos are like people: each serving is different. That is why we offer nacho bars in our catering services. We want all of your guests to let their culinary creativity run free. Learn more about our Mexican catering in Laramie today!